Here at Resmar we are proud to be associated with the Abtech range of safety products. The T03 is a two-person tripod, which is both strong, rugged and extremely stable whilst being highly portable at the same time. This tripod unit is ideal for confined space entry and rescue as well as being a highly reliable fall arrest and recovery system. The three tripod legs can be individually adjusted for maximum stability and it can be set up and carried by just one person. This highly reliable and lightweight tripod is manufactured from high tensile aluminium alloy. 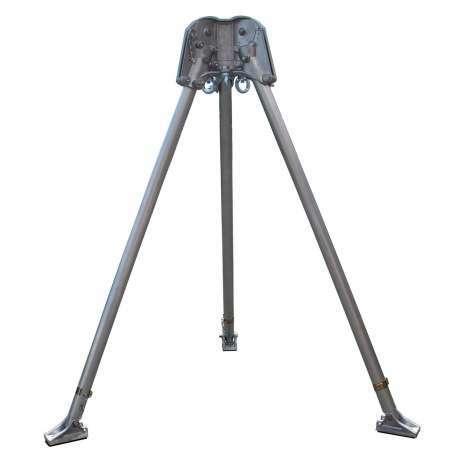 The TO3 three two-person tripod features six anchor points, which are tested in full compliance with EN 795. Also these extra anchoring points can be used with pulleys for a double roped rescuing system as well as for lifting airlines, backup, communication lines, tools and medical kits. It also features three overhead pulleys, which can hold rope of up to 11 mm thickness. This tripod has been manufactured in full conformance to BS EN 795 (type B). Weighing in at 14 kg this tripod unit is rated for a safe working load of 250 kg. The recommended service interval is 12 months.